With some of the world’s most iconic skyscrapers and plenty to see, New York City’s top viewpoints are worth finding. Whether by air, aboard a boat, or from atop a high-rise, here are some of the best spots to take in the beauty of the Big Apple. One of America's most iconic skyscrapers, the Empire State Building offers 360-degree views from its 86th-floor observatory. Climb to the top to visit its two indoor/outdoor decks, from which you can see Central Park, the Chrysler Building, the Statue of Liberty, and Times Square. Don't miss the Art Deco lobby at street level or the chance to admire the building itself—some tours offer access at sunrise for beautiful lighting or dinnertime for a meal. While in New York City, you have to catch the views from One World Observatory at One World Trade Center, the Western Hemisphere's tallest building. A Sky Pod zips travelers up to the 102nd floor for views of up to 50 miles away in each direction on a clear day. Pre-book your tickets for priority admission and a direct elevator to the observatory. 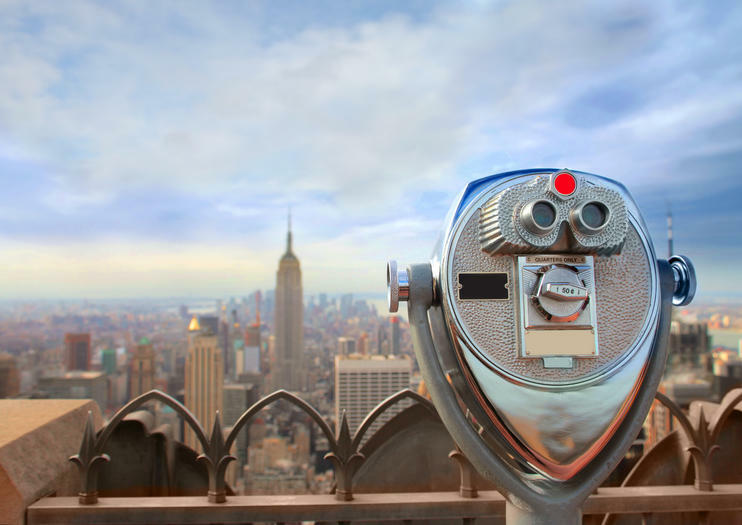 From the Top of the Rock's three floors of indoor/outdoor viewing areas, it's possible to see the iconic the iconic Freedom Tower, the Empire State Building, the Chrysler Building, and the Brooklyn Bridge. You can also take a 75-minute Rockefeller Center tour to learn about the building. There's no better way to get a bird's-eye view of New York City than by flying over it. On a 15-minute helicopter tour, you'll catch views of the Statue of Liberty, Ellis Island, Central Park, the west side of Manhattan, and more. Pass by Manhattan and the Statue of Liberty on a three-level boat on a Hudson River cruise. Daytime sightseeing cruises offer crisp views of the city, while dinner cruises typically include a three-course meal and plenty of time to take in the city skyline at dusk and by night. Ferry tours to the Statue of Liberty also feature great NYC views from the water. As day turns to night, its easy to see how New York City earned its City That Never Sleeps moniker. See the Big Apple in the light and dark with a day and night admission ticket to the 86th-floor observation deck at the Empire State Building—the highest observatory in New York City. Beat the lines by arriving with your daytime ticket, valid between 8am and 8:59pm, for 360-degree views of the iconic Manhattan Skyline and the Statue of Liberty. Then, return between 9pm and 2am for spectacular views of New York by night.